I'm giving my brain a wee break, and doing some regular swatching...with a Halloweeny twist. I will be back to crazy nails by Thursday, I promise. Today I am going back in time to 2013 and bringing back something from China Glaze's Halloween collection. It is also an untried, so I'm knocking that off the list too! Howl You Doin'? 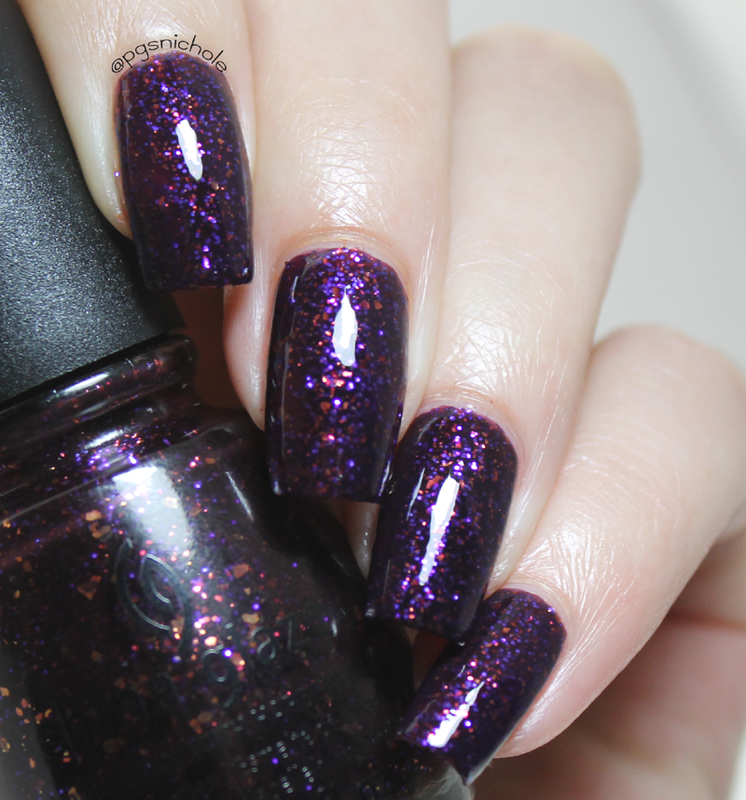 is a dark plum jelly-ish packed with flakes and glitters. It is very similar to Ginger+Liz Kicking and Screaming, but without the blue glitters. 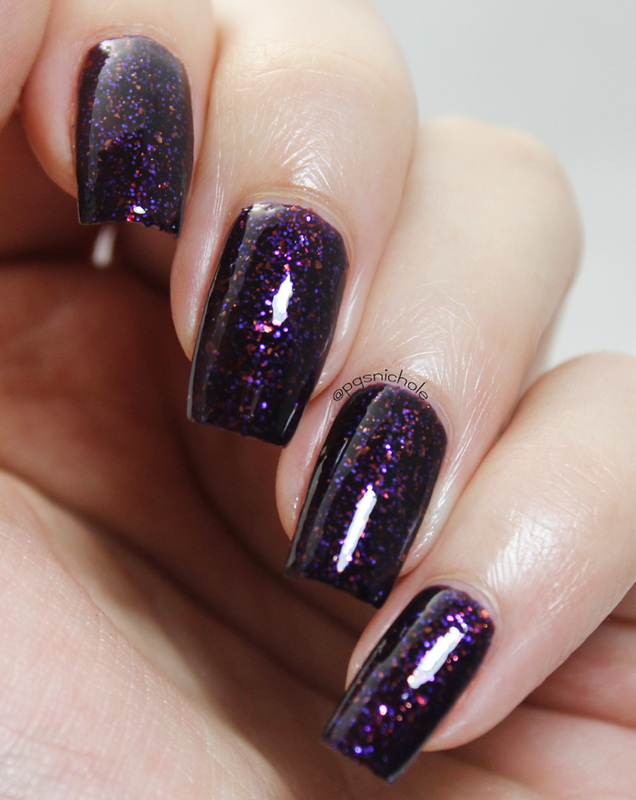 Instead of cool purple and blue glitter, it has warm purple and coppery glitters and flakes. It gives this one a far less uniform appearance, which I kinda like. The bases are very similar too. These polishes could be sisters. One major difference is that this stuff isn't quite as thirsty. I needed a layer less of topper to make this glossy, which definitely makes life a little easier. I think a bit of thinning might even make it smoother. More testing is required. This is a perfect transitional color for Falloween. 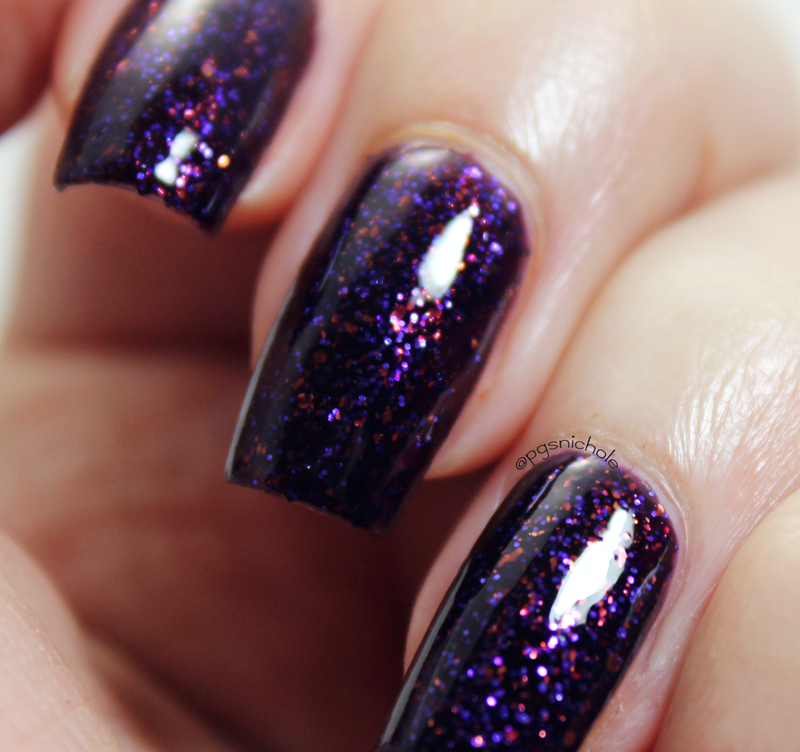 The purpley-orange glitter is definitely perfect for Halloween, but it doesn't beat you over the head with spooky. I can definitely appreciate that, especially compared to the typical orange+black+white color palette that a lot of polishes take when it comes to October. This is something you could wear from September to December without having to worry about being out of season...if you even cared. I don't. Watch me have a ghost-Santa manicure this year. I haven't seen any of the big brands offerings for Halloween this year. Honestly, I am not even sure if they are doing anything special. I am feeling like 2014 is the Year of the Indie, and Halloween is no exception. Maybe I need a scouting trip to Sally's and Ulta? Love this polish -- your photos really show it off beautifully!